Yesterday I posted the six boys looking the same direction and after reviewing my images from that day,I realized I had another image of them earlier in the day. This shot stands out in my memory because of the shot I missed right after this one. Whenever I attend events like this were Amish will be attending, I try and lay low below the radar and I try to capture spontaneous moments using long lenses. I snapped this image and immediately looked away to not draw attention to myself but as I glanced back at them I saw the smallest boy had both his thumbs against his cheeks with his hands stretched open and his tongue out as he made the funny face at whoever they were looking at.I no sooner started to lift my camera and he was finished with the show,and I can only imagine the unique shot I would have gotten. 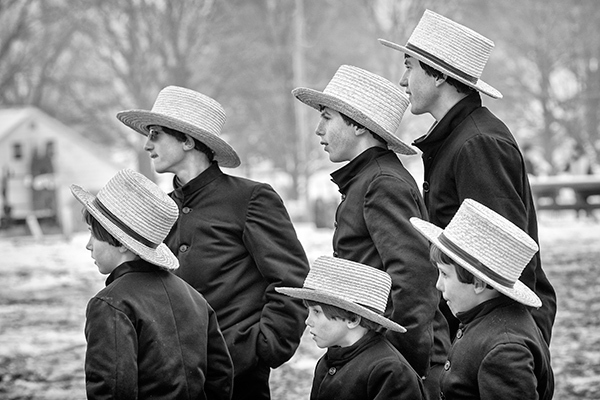 The Amish are generally conservative but I do occasionally see glimpses of things that reflect what the rest of the world does and these were just boys being boys. 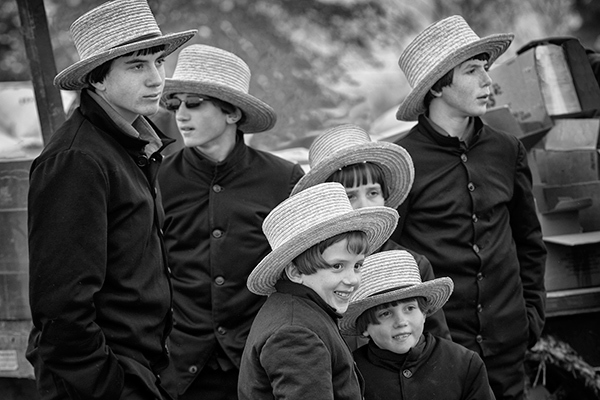 This is one of those fleeting moments that lasts just long enough to get one shot and then its gone.These six Amish boys were intently looking at an auction item that was being bid on at the mud sale and I had enough time to see the moment,raise the camera and snap one frame till they all lost interest and their attention went all over the place. 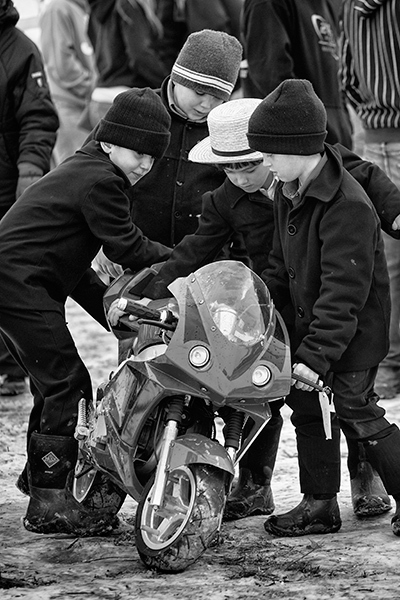 These Amish youngsters checks out kids motorcycles at the local mud sales. The boy in the upper photo tried the throttle and nothing happened but his imagination was wondering what it might be like to ride this pint-sized Harley, and the boys in the lower photo seem to have a need for speed as the check a kids road bike.Both cycles are kind of unique at a mud sale but you will see all kinds of stuff there. 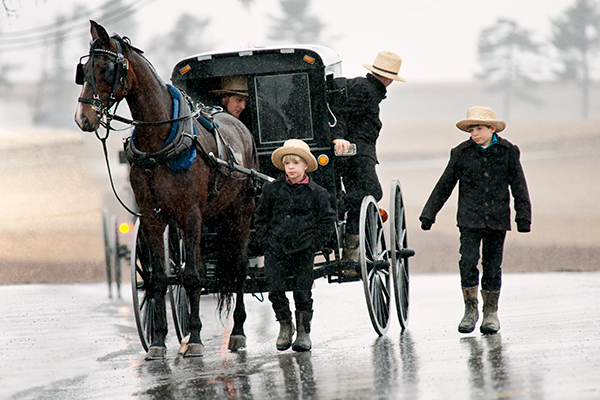 This Amish family arrives at the local mud sale in the rain and everyone quickly gets out so dad can go park the buggy.Pouring rain made this a miserable day but I shot this from the comfort of my truck up the road with a long lens. 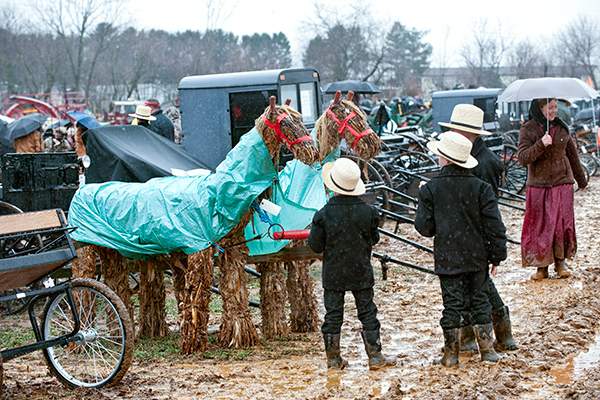 It was so wet at this mud sale these corn shock horses were even wearing rain gear,which made these Amish boys stop and take a look. 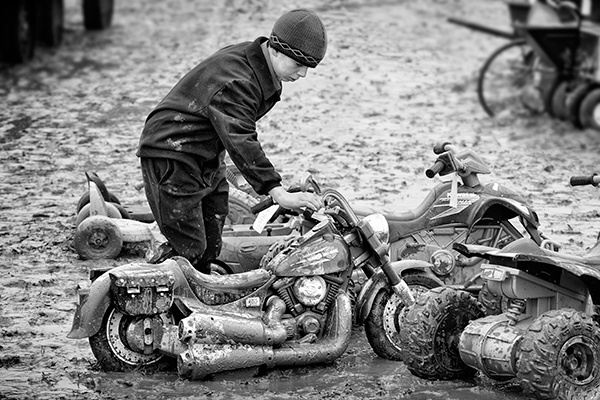 This is one of many images that I will be sharing from recent mud sales in my area. The first mud sale I went to was of epic proportions this year as rain fell most of the day on an already soaked ground from winter snow melt. The mud was up to a foot deep in some places and I saw more than one Amish gentleman walk right out of his muck boots as they stuck fast. These two guys are moving a purchased buggy through the mud and it appears if they wonder if the other guy is helping? 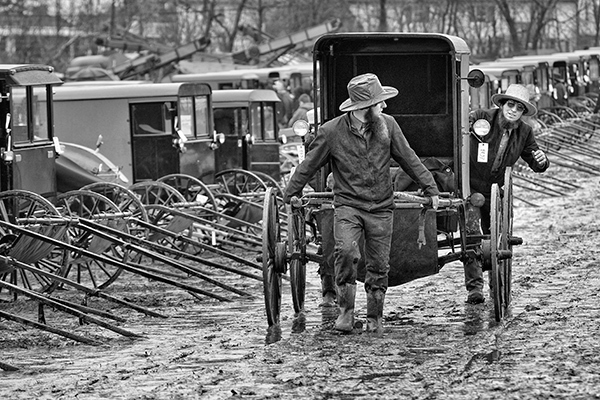 A mud sale is an auction held in spring and is usually muddy because of spring weather. I have had a real appreciation for the Amish culture for many years, and have captured many images over the years of life in the rural countryside in my area. Generally speaking, the Amish are not very accepting of photography and Usually I try to use long lenses to keep from getting in their face and allowing them to go about their day-to-day life without intruding. The reason I share this is because both myself and my friend saw something the other week that stopped us in our tracks. 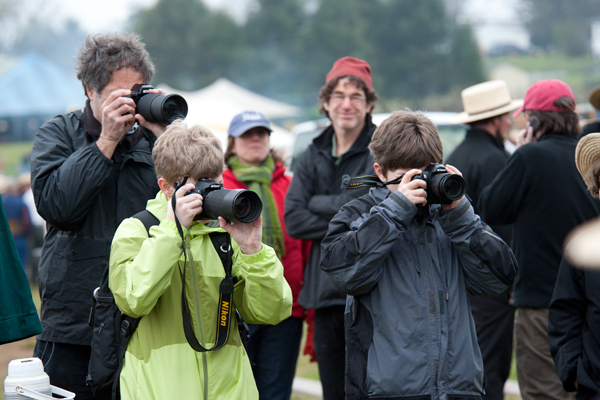 We went to the mud sale to capture a few images of local culture and we were using long lenses to keep low-key, but as we stood there talking, we saw a group of people heading our way and every person was carrying a camera. 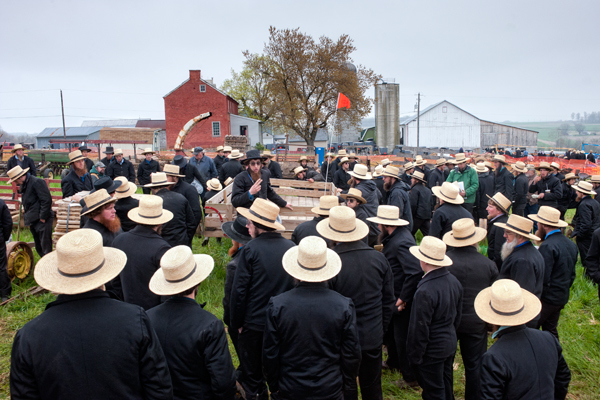 The Amish seem to accept the fact that they are at a public venue and that cameras will be there and they may have their photo taken by someone in attendance so they basically ignore the occasional snapshot being taken. This group was different, as dad,mom,brother,son,daughter and everyone else in their entourage was toting a camera. We thought nothing of this till we started seeing the younger kids going right up to Amish children and shooting right in their face, and then to top it off they would show them the image on the lcd screen. The truly baffling thing was the kids seemed to enjoy seeing their picture on the screen and would pose even more. We saw a few older Amish teens stop and look at the fiasco, but did not stop the activity, so we were truly puzzled. They would use wide angles and be feet from them and laugh hysterically as each new frame was shot, and I just stood there thinking I wanted to smack the whole crew. I figured if it was not bothering them, then who was I to intervene, plus I realize we have the right to take photos, but this was about as obnoxious as anything I ever witnessed. My friend walked away at one point because his head was ready to explode, and after I asked one kid where they were from, his parents came over and wanted to be buddy buddy with me,but I basically ignored them as I was growing increasingly irritated with them. Anyway, here is another image from the auction,plus one of a portion of their crew shooting like a hollywood celebrity was passing by. Hopefully they wont be back to our state anytime soon,but i am not counting on that happening as I was sure I saw the main guy here last year,minus his family. They will probably come in a tour bus next year with the relatives.